A closer look at how builders are failing to follow up with sales prospects and what this means for their business. Here’s a shocker: From 2012 to 2015, 40 percent of those who filled out a request for information (name, phone number, email address, and a specific question) on a builder’s website never got a return email. What’s worse, more than 70 percent of those online leads never got a single phone call. And a mere 3 percent of the 800-plus online secret shops conducted during those four years resulted in more than one phone call and two emails over a 30-day period. For the last five years, Do You Convert and Lasso CRM have partnered on an annual research project to analyze home builders and developers across North America. We study builder follow-up with sales prospects who have requested additional information on the builder’s website, and each year’s data has shown that our industry has yet to understand the potential revenue from those searching for a home online. The goal of this year’s study was to go beyond simply testing the quantity of the follow-up occurring and to begin to understand the quality of the follow-up that was being done. The results were no less surprising. This deeper dive needed another metric that we call the Conversion Quality Score, which ranks every follow-up received according to a three-point system. A score of 1: Like a task that’s simply checked off a list as complete by the individual responding, the follow-up was done but seemed cold and lifeless. A score of 2: The follow-up included a reference to some piece of information that was unique to the prospect or their initial questions, making it feel significantly more personal and providing the potential for the sales process to advance. A score of 3: By including not just references to personal information or questions, but also conveying genuine excitement at the prospect’s needs or belief that the builder and homes are a perfect fit for them, this follow-up stands out from the crowd. Every company is unique in its approach, and the beauty of this metric allowed us to grade the quality of the follow-up as impartially as possible. This year’s mystery shopper filled out complete registration forms on the website of each builder we surveyed. If the builder asked for a square footage or price range, one was given. Both an email address and phone number were included. A particular community had to be specified; submissions weren’t general. The builder was given the location from which the shopper was moving, why she was moving, and what she was looking for in a home, as well as asked two specific questions. The builder had every detail needed to understand the best way to approach the situation. Some 33 percent of the builders shopped never emailed back, and 80 percent never picked up the phone to call. 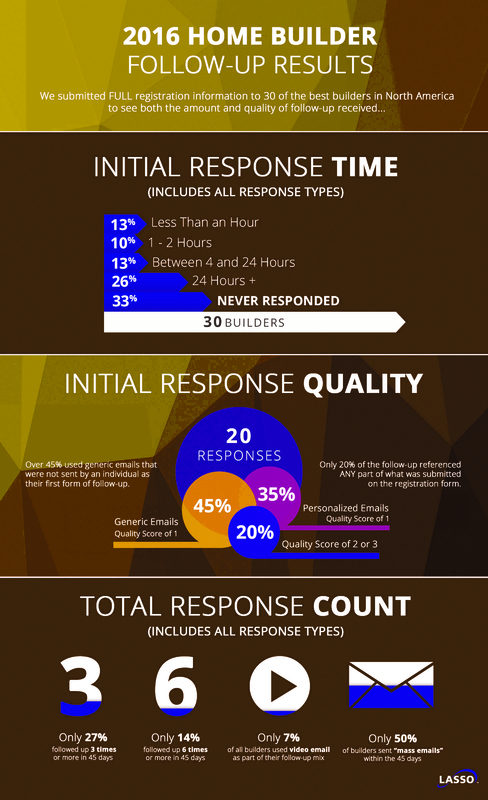 The majority of responses occurred after 24 hours (auto-responder emails weren’t counted), and just 13 percent called or emailed within 60 minutes. Once again, just 3 percent made more than one phone call and sent more than two emails in a 30-day period. Our research pays special attention to the very first follow-up received. While I’ve written before that we believe in long-term follow-up with all prospects, the first contact is the most important and deserves your best effort. The speed and the personalization of the first response have an enormous impact on successfully scheduling an on-site appointment. More than 45 percent of first responses were glorified flyers or brochures, and 80 percent of them ignored every bit of information that our shoppers submitted. The builders didn’t refer to the community the shopper asked about. They didn’t make note of why the shopper was moving from Montana. They didn’t acknowledge that the shopper was looking for a three- or four-bedroom home. They didn’t even attempt to answer either of the shopper’s two specific questions. The best summary of what we received is this: Thank you for requesting information from us. Could you please tell us more about your situation or answer the questions below so we can better understand how to help you? Thank you for contacting us—we look forward to building your dream home. The overall average Conversion Quality Score was a dismal 0.8. The best average score by a single company was 2.3, but that company only followed up a total of three times, and all those attempts came within the first 24 hours. There were no additional personal attempts made after that. What explains the minimal attention these leads were given? There is no explanation, other than a lack of conviction that online leads are as qualified or more so than walk-in traffic. 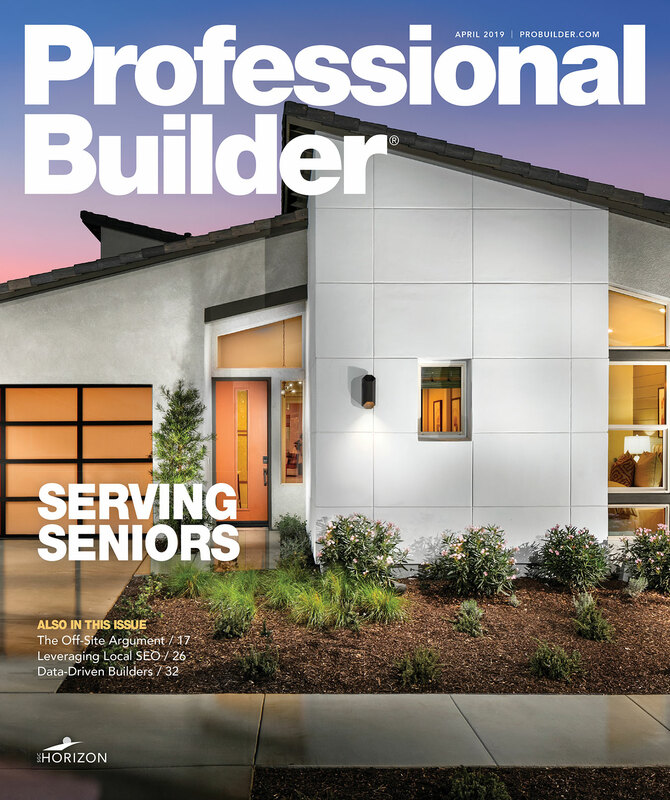 Keep in mind that the revenue of the companies we shopped, according to Professional Builder’s 2015 Housing Giants list (probuilder.com/2015-housing-giants-rankings), was between $79 million and $8.4 billion. They all have the resources to correctly handle online leads, and yet they’re still missing out on the opportunity right in front of them. The takeaway: Pay attention to online responses. Location, product, and price play a large part in how you compete for market share. But there’s a real competitive advantage to putting the right processes in place so that follow-up to every lead is responsive, personal, and persistent. The takeaway: This is a huge opportunity. According to our data, 97 percent of your competitors are using follow-up that’s wimpy at best. For results of this survey, visit lassocrm.com/2016survey.